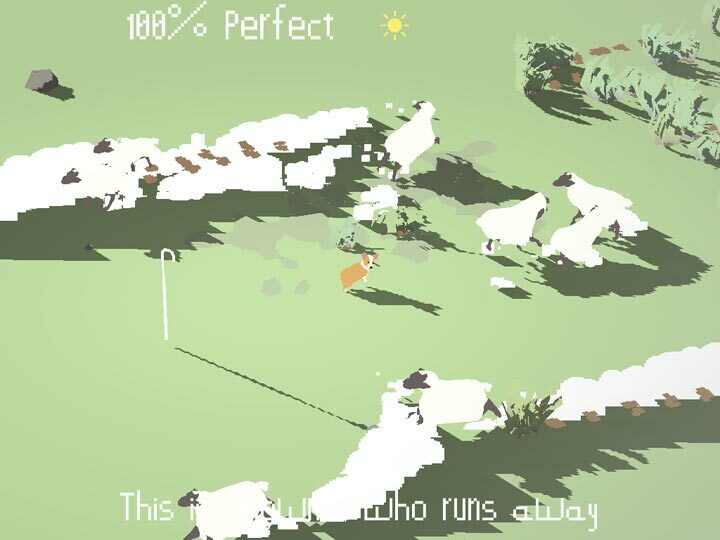 I recall reading about the Ian Cheng's piece for the second Digital Commission from London’s Serpentine Gallery titled Bad Corgi and was immediately intrigued. This is a game purposely designed to force players into a state of uncontrollable mayhem. Not to worry though, it's done in an interesting art style with cutesy effects and music that make the puppy's misbehavior a little bit more tolerable. 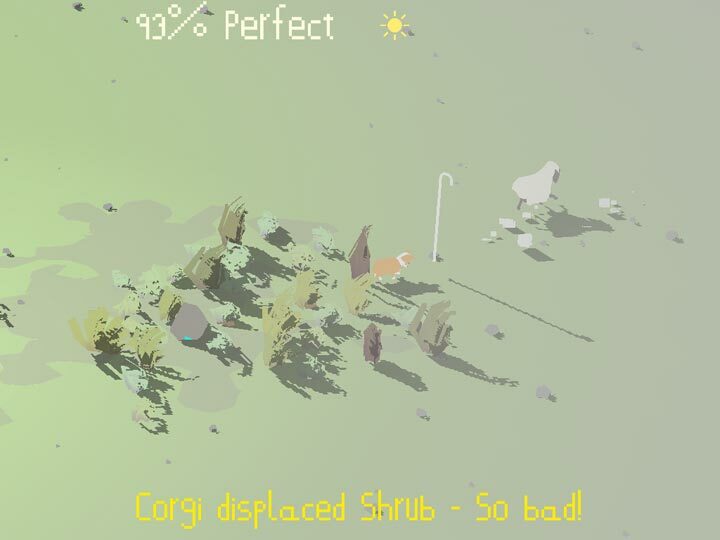 So, in Bad Corgi, you are given only the slightest control at first, and it degrades to the point of being a spectator with absolutely no control in watching the world do its own thing as the corgi goes on a tiny, wild, and furry rampage. The game puts players, or more accurately- viewers- into a place where we generally just have to let go. There's no real way to corral the devil dog as it's whims will always override yours in favor of whatever distractions capture its attention. There's a good reason the flock of sheep's shepherd isn't visible in the game (just the shepherd's staff)- it's because all real control gets relinquished to that of the bad corgi itself. The goals here are rarely obtainable, and I've only completed a single one- removing all shrubs. Even the random occurrences are strange and stressful. Garden hoses chase ducks, rocks follow you and smash other flock members, and garbage bags swallow and slowly kill your animals. All the environmental interactions are sporadic and truly unpredictable. It's the way of the world, and we just have to accept it. It seems like a pretty decent idea, Bad Corgi on the surface comes across as apparently saying that letting things fall into disarray and shambles is the natural order of things, but it's not true. We may not be able to control things, but that doesn't mean letting go of the wheel while driving 60 mph on an iced-over highway because you are stressed is a good idea. We can't control everything, but we can control some things, and this game revels in the intentional frustrations of its players. It wants you to not only expect it, but enjoy it as well. It asks us to note those things, to focus on what makes us frustrated and anxious and in simply acknowledging them, it gives us an odd sense of control over the emotion. Bad Corgi is a neat experiment about the nature of acceptance of all those things we can't change- it shows us that sometimes things are indeed impossible, but it doesn't mean we should stop trying to do what we can to avoid total chaos anyways. Sometimes it's perfectly all right to go with the flow and enjoy those moments, allowing us to give in and take pleasure out of it instead of raging against them and letting them bog us down with feelings of futility or failure. We learn to cope with this sense of disorder through our recognition of its effects on us, and how we then proceed to deal with it, and that is a wonderful realization.